Last edited by Charlie on Tue Apr 30, 2013 3:22 am, edited 2 times in total. that's what i noticed about Guadalupe too. .
her beauty is in the league of the 3 mentioned above! btw, what pageant did she represent Paraguay before? ? ? she really is interesting and this is a great batch! Jictzad Viña is that you...WTF?!?!?!?!?!? Last edited by Juan Sebastian on Fri May 17, 2013 5:03 am, edited 1 time in total. Various gorgeous girls up there! I liked Karen, Coral and Guadalupe. Some others have potential. we r who we r!!! Message: Hi Missosology ! i'm one of your biggest fans. kenhan wrote: Jaishee is right. .
She represented Paraguay at Miss Atlántico Internacional (Uruguay) and Miss Latin America (Panamá), both in 2012. Coral Ruiz have already joined Miss Paraguay in 2011, she ended up as 1st Runner-Up.. Candidate # 4 (Coral Ruíz Reyes) and Candidate # 9 (Paloma Ruíz Reyes) are siblings. Out of all of them, Guadalupe stood out the most to me in terms of first impressions! "There is no need to imitate any man in order to be at their level. We are all created equal." Only Zulma, Karen or Coral..
but they seem like clappers either..
Nice year for Paraguay, strong batch again, with no clear winners. Almost everybody in the forum likes Guadalupe, she improved a lot since 2011, she has the sparks that a Miss Universe contestant needs to be noticed and to be successfull, (considering our weak sash). But I´m not sure if she will impress the judges as she has impressed here in the forum with her pics...lets see...Karen Duarte is another strong contestant, as Guadalupe, she will be a great choice for any international pageant. I feel that Coral has a lot of chances too, She was the first runner up in 2011, behind Alba, Nicole ans Estefanía, so let´s give her some credits...I also liked Gissella Sotomayor, very beautiful in those pics, some forumers noticed her too...a top model-type beauty, nice surprise...My fifth spot (in random order) goes to Laura Garcete, I like her, she has some experience and can represent us very well if she gets any of the four crowns...hope to see more interesting girls to be added to the list of official contestants. Great job Charlie!!! rvaliente wrote: Nice year for Paraguay, strong batch again, with no clear winners. 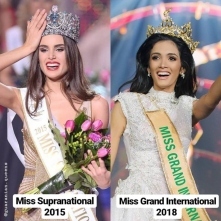 Almost everybody in the forum likes Guadalupe, she improved a lot since 2011, she has the sparks that a Miss Universe contestant needs to be noticed and to be successfull, (considering our weak missosology.org). But I´m not sure if she will impress the judges as she has impressed here in the forum with her pics...lets see...Karen Duarte is another strong contestant, as Guadalupe, she will be a great choice for any international pageant. I feel that Coral has a lot of chances too, She was the first runner up in 2011, behind Alba, Nicole ans Estefanía, so let´s give her some credits...I also liked Gissella Sotomayor, very beautiful in those pics, some forumers noticed her too...a top model-type beauty, nice surprise...My fifth spot (in random order) goes to Laura Garcete, I like her, she has some experience and can represent us very well if she gets any of the four crowns...hope to see more interesting girls to be added to the list of official contestants. Great job Charlie!!! You are welcome. Nice points of views about your favourites. I like the girls that you mentioned, but there is a girl that I really don't like, Coral Ruiz, she is so plane, she doesn't have the sparks that a beauty queen needs, besides, once I met her and she is so bored, and her "beauty" is not what we see in photos, too much photoshop. P.S. : There are three more contestants that the organization hasn't published yet. I hope we can see in these 3 ladies a lot of potential too. Guadalupe has Miss Earth's face! NATHALIA ASCONAS - best face for me based on the shots above.